Not sure which headlamp to get? Treeline Review gives you the information you need to choose for yourself, including what features are must-haves and common pitfalls of mediocre headlamps. Treeline Review aggregates other gear reviews so you can save time and make an informed choice on buying headlamps. We chose the Black Diamond Spot because of the plethora of reviews citing it as the best balance of ease of use and price. The Black Diamond Storm is the Best Overall Headlamp because reviewers found it to have many of the same features as the Spot but to be more reliable and durable. Reviewers found the intelligent lighting in the Petzl Reactik to use futuristic technology that actually works. We also found high reviews for the hybrid battery and The rechargeable Petzl ActikCore and the budget Petzl Tikkina are much-loved rechargeable options that reduce your need to buy (and then throw away into a landfill) batteries. Headlamps are a hands-free way of lighting your way through the dark. Headlamps create enough light so that you can run, walk, read, or do camp chores. But they also need to stay put on your head and be comfortable while you’re in motion. The battery should last long enough so you won’t need to fumble for replacements in the dark, and replacing batteries or toggling between settings should be equally hassle-free. We researched the most popular comparative reviews of headlamps. Based on those reviews, we aggregated their findings. These are the headlamps that consistently get highest marks from the most reviewers such as those at REI, Amazon, Outdoor Gear Lab, Outside Magazine, Backpacker Magazine, Mountain IQ, Switchback Travel, Wirecutter, Digital Trends, Adventure Junkies, Gadget Review, and The Big Outside. What makes a great headlamp? After analyzing and aggregating professional reviews, we found 29 headlamps that were celebrated by one reviewer. But when we considered the headlamps that had four or more reviewers with positive reviews of a model, that number went down to just five models. In the process of researching the 29 models, we developed criteria that professional and everyday customer reviews agreed were make-or-break-it factors when choosing a headlamp. Headlamps can differ significantly in price depending on what functions you need for the activities you do. Because a headlamp is a safety item, we realized there are situations where choosing a more expensive headlamp may be a good idea. But we also include a budget option for situations where having the most lighting possible isn’t required. Don’t be fooled by the marketing terms. Brightness is important in a headlmap, but there are many ways to measure that brightness. Light is usually measured in lumens, but a higher lumen rating doesn’t always mean a brighter-looking lamp. Why? The distance your headlamp can throw light is impacted by reflectors and lenses inside. Max distance of headlamp beam by model as reported by manufacturers. (See below for more on that). Diagram by Naomi Hudetz. We’ve found that the headlamp that throws light the farthest distance isn’t always the best for every activity. Gadget Review estimates the distance needed for casual hiking to be 150 feet, where trail running is 30 feet, hunting is 350 feet, and caving/mountaineering is 400 feet. (We were skeptical of the 30 feet, but after interviewing several trail runners, most said having a very bright light immediately in front of them for foot placement choices was more important than distance). Often, headlamps that throw light far use more batteries. 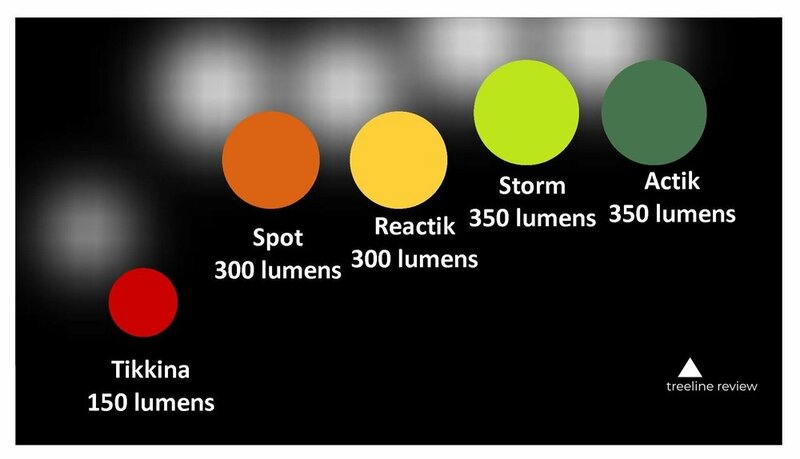 Most headlamp companies will tell you lumens and distance in their specs. However, Outdoor Gear Lab warns that brand-reported numbers may be faulty. Our findings are based on aggregating lumens and distance numbers from field tests noted by other reviewers. As battery is used, light brightness and distance will go down. On many headlamps, the light will dim as you use more of the battery, reminding you to replace or recharge before it is too late. Some headlamp manufacturers try to address this by having regulated output, which keeps light brightness somewhat consistent across the battery’s life. But your headlamp may run out of battery without giving you warning. Some headlamps, like the Black Diamond Spot, come with low battery warnings. These indicator lights are a middle ground to provide you maximum light over a battery’s life without the awkward burnout. Almost all the headlamps we tried have a spot beam to focus on the immediate task at hand. Photo by John Carr. A wide beam allows you to see your surroundings better. Photo by John Carr. Sometimes, you may want dispersed light, called flood lights, which yield a wider viewing range. Flood lights are useful if you need to illuminate an entire campsite or if you hear rustling somewhere in the woods and need to find that bear. Conversely, use a spot light while doing close-range activities like reading or cooking in camp. REI explains the advanced modes and the situations where they are useful. This allows you to move the headlamp up or down to change where the light focuses. This angle adjustment makes it easier to switch between when you are hiking straight ahead or when you are reading or cooking in camp. A tilt has enough hinge to stay put where you want it, but won’t get stuck, either. All the headlamps we considered have tilt adjustment, although it is often a feature not found on cheap headlamps. Optical quality means how uniform the light looks across the entire beam range. We were cautious about reviews that mention flood lights with dark spots. We also noted when reviewers mentioned bands or hotspots of brighter light in flood mode. Red light is an important setting found on most of the headlamps we considered. It saves batteries and is also easier on the eyes. Photo by John Carr. REI and Amazon headlamp users’ biggest complaint about headlamps in general is getting the darn thing to the setting you want. Headlamps usually have a distance mode, proximity (spot) mode, and red mode. Some headlamps have many more modes like a blue light or strobe light. Toggling between each light mode should be easy. But too often, it requires memorizing sequences of taps and commands like a lit-up Morse code. Quality headlamps should include a distance light, a wide flood light, a spot light, and a red light. Our Researcher’s Best headlamps have easy-to-use and easy-to-navigate button settings that provide the light you need without creating confusion. Lock mode prevents the chance that your headlamp turns on by mistake. When your headlamp jostles in your backpack during a trail run, that force can accidentally toggle the headlamp into On mode. Many cheaper headlamps can turn on by mistake. This drains batteries and can leave you in the dark without a functioning light. A simple lock function works like a two-factor authentication to make sure you really want your headlamp on. A quality headlamp should stay on your head without pinching or causing a headache. Photo of Treeline Review writer Amanda Jameson by John Carr. It’s important that the band that keeps the headlamp on your head feels comfortable when worn. It also needs to be secure on your head, even when you are moving or looking down. It should stretch to fit your head and shouldn’t slip. We don’t think it’s practical to tuck away cords, battery packs, or other dangling headlamp parts. You shouldn’t need to stuff your gear into your shirt to keep its parts out of the way. We believe a headlamp should be made of quality plastic that won’t break when dropped. It should be easy to replace batteries or plug your headlamp in for a recharge. Flaps or panels that protect the batteries or charging port should be secure. They should not open during a run. Headlamps should not rust or have electronic issues after external exposure to sweat or a sprinkle of water. While some headlamps we considered are more waterproof than others, moisture shouldn’t reach a closed battery or USB ports. We noted when reviewers complained about waterproofing. 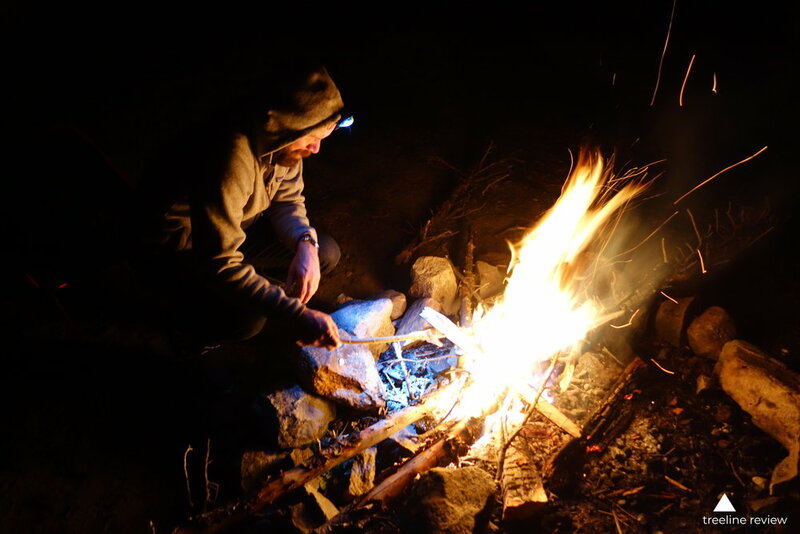 There are a few things you can do get the most battery life out of your headlamp and make its use more enjoyable for yourself and others. Always check headlamp batteries before starting a trip. If your headlamp has a lock mode, use it while in motion to prevent accidental battery use. If reading your map by headlamp, use the white (or if available, blue or green) mode. Some colors or topographic lines on maps do not show up well in red-light mode. Photographer John Carr takes a selfie in camp. Photo by John Carr. Leave No Trace Outdoor Ethics offers guidance on how to respect other users in the outdoors. When in camp, headlamps can impact other users’ experiences, especially when shining headlamps in faces. If your headlamp has a red light mode, use that in camp so as not to blind campmates. Always follow the manufacturer’s battery recommendation (e.g., alkaline, lithium). We learned this one the hard way, too. Traveling in the cold? Use lithium batteries, not alkaline or rechargeable options. Alkaline batteries use a chemical reaction that uses a water-based electrolyte. Below freezing, alkaline batteries may have poor performance or not work at all. Rechargeable lithium batteries like found in the plug-in headlamps we recommend may also perform poorly in cold conditions. If you are camping and think temps will be below freezing, consider keeping your headlamp in your sleeping bag to keep the battery from getting cold. Curious about what headlamps made our list? Read Treeline Review’s Best Headlamps of 2018 full comparative review here or check out the Headlamp Side-by-Side Comparison Chart.